Currently viewing the category: "Swing State Voices"
Women’s Equality Day should not be a thing. It could easily be dismissed as a participation trophy, but for the love of all things holy, we had to fight hard to participate. 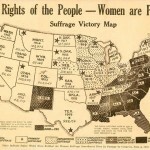 The day honors the 1920 adoption of the 19th amendment, which (finally!) granted women the right to vote. The suffragettes were relentless, fierce, and focused. We need a little bit of that right now. Politics saves lives and politics takes lives. Maybe you’ve always known this, but are only now realizing how policies impact you and your community. No matter what your situation, at least now you have realized: It is time to make the time. It’s time to get political. Our Congressman, Steve Stivers, came to Nelsonville yesterday, and we were ready for him. The meeting was organized by city council as a public meeting to which he was invited, but was quickly taken over by Stivers’ office and turned into an exclusive, invite-only meeting, and…they controlled the guest list. Most of the elected officials and runners of agencies in Athens County were there, but no member of the public was allowed in.